Most of my life has been spent traveling and moving from place to place and job to job. The one constant was my mother’s house. My dad had built the house and when he passed away (I was 16) it was like time stopped. The place looked exactly as it had for all my life, right down to the avocado kitchen cabinets and gold wall-to-wall carpet. But it was home and Mom always gave me a place to land. The number of boxes stored in her garage, including the darkroom I’d built right after college, was enormous. I’d just returned from one of my “moves” and landed a job with the Wildlife Conservation Society, and decided to go back to graduate school for a Master’s degree. Limited funds and apartment rents in NYC made me decide to live at home. I always got along well with my mother so making the decision to live at home was not hard for me. It was great. I had a bit of a commute, but I also had people to car pool with; and, I’d come home to dinner on the table. 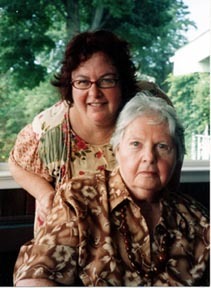 Mom was very easy going and in the evening we’d enjoy our favorite television shows or listen to music and talk or read. I began to notice that Mom had a twitch in her thumb. One night, after she had played several sets of tennis, she really began to complain about her thumb. When I asked her about it, she said it had been happening on and off for some time. She had it checked out and told me that they did not find anything to cause this other than stress on a nerve from holding her tennis racket. Time passed and the opportunity to work on a film in South America came my way. Once again, I bid my familial home adieu and headed off for an adventure. About half way through my film shoot a call came in from my brother, “something is up with Mom. She’s forgetful and seems really lost. She’s convinced we’re hiding you from her. Would you give her a call and let me know what you think?” Well, you don’t get a call like that and ignore it. I wrapped my shoot as quickly as I could and got back home. My brother and sister had hired someone to come and help Mom out a couple of days a week, but it was obvious that she would not be able to stay in the house alone. I had just started my own production company and was based in Cambridge, NY..about 3 hours north of Mom’s so moving in with her was not really an option for me. We decided to activate her long-term care policy and have help come in on a daily basis. She seemed okay, really. With someone coming in the morning and staying until the afternoon, she had all her meals covered and could stay at home. Then I get a call from my 90 year old cousin Freida. “Debra, you’ve got to get down her right away. Your mother is convinced you’re dead and is in a panic.” I flew down the Taconic Parkway and insisted she see the doctor. I told him something was wrong and that she need to be checked out in a hospital. He then informed me that she had Parkinson’s disease, a little something Mom neglected to mention all those months ago. Actually what she had was Louis-bodies Disease, a form of Parkinson’s that has a dementia component. With proper medication things seemed to be going well, but Mom could not live alone any longer. Now it was my turn to provide a soft landing and loving environment. I put an addition on my little farm house, adding handicap bathroom, ramp and an amazing room that had french doors out to the deck and backyard. For nearly 4 years my mother lived with me and we had fun. We explored the surrounding countryside, planted a huge vegetable garden, went to movies and enjoyed our life together. It was not easy for me. I basically had to stop working as I could not go on out-of-town assignments. When I needed a break, I had to hire someone to come and stay with mom or drive her to my brother’s. But we talked about everything from the hard times I gave her as a teenager, my father’s death and how it effected her life, how proud she was of me (she never stopped telling me that), anything and every topic was open to our conversations. As these things go, Mom’s illness began to get the better of her. She was having more and more occurrences that required hospital and/or rehab care. And then it happened, a rush to the hospital, calls to siblings about decisions to make. Thankfully, my mother and I often talked about end-of-life care. She did not want any extreme measures taken and put all that in writing in a Living Will. I had her Health Care Proxy and the hospital had all these documents on file. So when it became clear that she was nearing the end, we decided to do hospice care in my house. The doctors thought that she might hang-on for about 4 more days. Family was called in to come say their good-byes and my sister came to stay with me, thinking it was just 4 days. And then the best gift I ever got was given to me by my mother. For 3 weeks my sister and I spent 24/7 together…no husband, children or work to distract us. We just sat with mom, took long walks and had the opportunity to spend some real time with each other. I don’t think my older sister and I ever spent that sort of time together and it has created an amazing bond between us. We were both with mom when she passed, holding her hands and telling her how much we love her. What a great way to go…in your own bed, surrounded by your daughters and listening to your favorite music. A final small puff of air and then an expression of true restfulness and peace. In death my mother gave me the gift of time with my sister in a way we would never have given ourselves. Everyday I miss her and every Mother’s Day I celebrate her and the life she showed me how to live. Happy Mother’s Day, Mom. Debra Pearlman Has Written 23 Articles For Us! I own my production company, Peal Productions LLC. I now make my living as a documentary filmmaker who specializes in natural history and wildlife. I get to travel and experience amazing things, but I also know how hard it is to be a woman of a certain age, trying to make a living. I expanded my production company to include work in digital media, social media, and website design. This combines my photography/graphic arts/environmental science degrees and keeps me employed. Thanks for sharing such a beautiful part of your life, Debra. Your story is wonderful. You and your mother shared the kind of time and connection often missed as we live our lives and our parents age. And the time with your sister wouldn’t have happened any other way. There seem to unexpected gifts that come from situations we wouldn’t have chosen. It’s being able to recognize them and feel gratitude. Debra- What a beautiful story, you brought tears to my eyes, and a smile to my heart. What a kind and loving experience you were able to give…and receive! Thanks Polli. It was an amazing experience and one I would encourage anyone dealing with end of life issues to consider – Hospice at home. Debra – Your beautiful story reminded me of a line from one of my favorite books, The Little Prince. “It is only in the heart that one can see rightly, what is essensial is invisible to the eye.” Thanks for letting us into your heart. Toby – Thanks and happy to help. Your story is wonderful, I wish I’d known your mom. Me too .. she would have loved you .. and I yours! Thanks S – love your post too. Debra; What an honour to read about your last years with your mum and then at the end the closeness with your sister, and the bonus time you three had together. So much emotion in your words. Beautifully written. Thanks Andrea, and Happy Mother’s Day to you and your mum!